At St. Joseph’s Catholic School in Calabogie the 2018-19 school year has been filled with activities that “reverence the dignity” of each individual within our school community, shared Principal Heidi Fraser. Recently, students and staff celebrated Shrove Tuesday with a pancake lunch put on by the Grade 4-7 class. “Students used the culinary skills they are honing from the You’re the Chef program, to whip up the tasty meal,” notes Fraser. Staff celebrated Ash Wednesday with a Mass at Our Most Precious Blood Parish with Father Starks, who reminded everyone that during Lent we are called to give, fast and pray. This year St. Joseph’s moved its Spaghetti Dinner into the Lenten season as this fundraiser solely raises money for the Dominican Republic Experience and another charity of the school’s choice for the year. “We believe Lent is a perfect opportunity to practise almsgiving and share with those less fortunate than ourselves and look forward to completing this fundraising event for worthy causes,” says Fraser. Over the course of the year students have had the opportunity to engage in inquiry learning using various types of low and high technology. Teachers have been learning how to incorporate things such as LEGO, green screen technology, sound booth technology, microbits, Spheros, etc., into their everyday curriculum lesson. Valleycrest Renfrew has been blessed this school year to receive a wealth of hands-on learning about Indigenous culture. Students had the opportunity to visit the Métis Nation of Ontario in Renfrew on two separate occasions—the first to learn how to make Bannock, a traditional Indigenous bread; and the second, to make personal Medicine Bags. “On each occasion, the Elders who led the students were very informative, and the children were able to take away invaluable information,” said Heidi Fraser, Special Education Principal. Kim Isobel from the Métis Nation of Ontario also visited the school to take the students snowshoeing along the Millennium Trail to discuss the importance of self-care and nature. Kellie Hisko, RCCDSB Indigenous Lead, also arranged a multitude of Indigenous events for Valleycrest. Jingle Dress Dancer, Helen Baillie, a student from St. Joe’s High School came to the classroom and presented her winning speech about Jingle Dress Dancing to the students and taught them to try. Valleycrest was also blessed to have Frank, Katelyn, and Brian Sarazin from The Algonquins of Pikwakanagan First Nation teach the students to make their own bear skin drum and how to play it. They also were taught how to paint a woodland animal on the drum by Sylvia Tennisco. “The students were thrilled to have this amazing opportunity to take this drum home to cherish forever,” said Fraser. Students and staff of St. Joseph’s Catholic School in Arnprior took some time to recognize World Down Syndrome Day on Thursday, March 21. The purpose of the day is to raise public awareness and create a single global voice for advocating for the rights, inclusion and well-being of people with Down syndrome. “As part of our celebration we wore crazy socks! 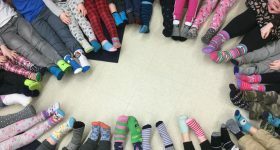 The crazy sock initiative was formed to get people talking and asking questions about Down Syndrome,” explained Principal Derek Lennox. The idea was to wear brightly coloured, mismatched, long, printed socks — or even layer three socks, one for each chromosome. Why socks you ask? The striped long socks resemble chromosomes, and who doesn’t love a pair of crazy socks!? The SJC WE team organized a dance party for all classes. “Plenty of fun was had by all” said Principal Lennox. At St. John XXIII Catholic School in Arnprior, students have been engaged in many winter activities shared Principal Christina Brown-McGrath. The Nick Smith Centre graciously opened up the rinks for our students to skate and each class had the opportunity to go skating as part of their physical education class. “It is a wonderful fun experience for all of them. For some, it was their first time learning how to skate. We thank all volunteers who came out to assist in driving skaters to and from the arena, tying skates and supervising,” said Principal Brown-McGrath. Grade 6 classes also had the opportunity to meet with their counterparts at St. Joseph’s Catholic School to skate. This was a wonderful transition initiative as students will be joining next year for Grade 7, noted Brown-McGrath. Grade 4-6 students participated in two ski sessions at Pakenham Ski Hill and, as part of the primary winter carnival, Grade 1 to 3 students had a fabulous day snowshoeing at the Mill of Kintail. On March 20, Kindergarten students visited Fulton’s Pancake House and Sugar Bush to foster a love of the outdoors and learn about the maple farm. “Students left with smiles on their faces and bellies full of delicious pancakes!” shared Brown-McGrath. All students mastered their communication skills by participating in a school-wide public speaking contest on February 7, with a few students moving on to the Legion Competition. To help spread the love and celebrate each other, School Council hosted a Family Valentine’s Day Dance. Students, parents and staff danced to the beat of Wes Snobb’s DJ services, tested their luck with 50/50 tickets, bake raffle, and “Can You Guess? Jar”, enjoyed refreshments and purchased lots of fun glow sticks. During these 40 days of Lent, students are given the opportunity, as followers of Jesus, to walk again with him on a journey of love, faith and hope. “To mark the beginning of Lent, Father Michael and Deacon Chris presided a prayer service and distributed ashes. Grade 6 students led the readings and our choir did a beautiful job with the music ministry. Many classes continue to pray, fast and provide almsgiving,” said Brown-McGrath. The St. John XXIII Grade 6s won the Small School Basketball Championship at St. Joseph’s High School on March 7, developing both skills and good sportsmanship along the way. Also, four Grade 6 students headed to Shaw Woods today (March 25) to compete in the RCCDSB Winter Games. Some other exciting initiatives include morning tutoring to assist students in developing numeracy and literacy skills, and a new afterschool program led by teachers, ECEs and EAs called “The Art of Play” to provide fun learning opportunities for students with autism in small group social situations. Also, students in the Grade 11/12 Recreation and Healthy Active Listening class at St. Joseph’s High School will demonstrate leadership skills while engaging Grade 6 students in various activities during gym classes. A number of St. John XXIII teachers applied for and were successful in getting an Innovative Learning Funding grant. “With this grant, they have purchased a plethora of new technology that will be used to engage students and enhance their critical thinking and innovation abilities. Lots of self-directed professional development is and will continue to occur,” says Brown-McGrath.